Are you a technology fan and gamer with a love for the sixties? 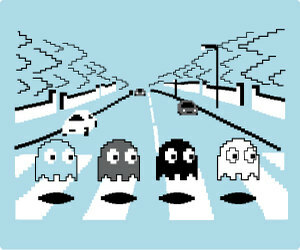 Join the club here at the Wired Jester, and get yourself this t-shirt from Huzzah, which rather wonderfully brings together PacMan and Abbey Road Roll. It can be yours here. This entry was posted in T-Shirts, The Sixties. Bookmark the permalink. TheWiredJester’s found a great T-shirt that I might have to look into along with the ‘Han Shot First’ one I spoted the other week.PS, this is a test of this new blogs trackback functionality! Super! I guess that means I have an active and fully functional install again!